Jin Wang was born in the United States, grew up there like most of his classmates, and has never even been to China, and yet, wherever he goes, his Chinese heritage is inescapable. If it were simply a matter of withstanding the bullying of his classmates, it might not be so bad, but as the years pass, the worst contempt for his heritage starts to come from within. Interwoven with this coming-of-age tale are two complementary stories: a retelling of the Monkey King’s origins from the classic Chinese novel Journey to the West, and the story of Danny, an average (white) American high schooler who receives a humiliating visit from Chin-kee, his pig-tailed, bucktoothed, slit-eyed, Chinese-stereotype cousin. As these stories alternate, the juxtaposition of the three tells one unified story about a search for identity, once abandoned, and now renewed. Jin’s childhood, from elementary to middle school, is miserable in a believably restrained way. As with just about any child, his life is not simply a parade of woes, and so he manages to make a few friends, including a Taiwanese boy, Wei-chen Sun. The more obvious instances of bullying eventually peter out, and yet by that point, Jin has has grown so accustomed to a social gap between himself and his peers that he no longer tries to bridge it. It is only when he develops a crush on a white classmate, Amelia, that his dreams of achieving normalcy to impress her threaten to upend everything in his life, even his very identity. Jin Wang’s story might be the most central of the three, but this comic is best read as a kind of triptych, where no one part can convey its real meaning without the presence of the other two. All three protagonists—The Monkey King, Jin, and Danny—are burdened by similar anxieties about their origins: the Monkey King by his species, Jin by his ethnicity, and Danny by the incongruous Chinese-stereotype that he somehow shares grandparents with. All three parts feature similar conflicts as well, with the main difference between the three being the level of plausibility: one is fairly mundane, another is a fantastical story with Gods, demons and superhuman kung fu abilities, and the last one is almost as commonplace as the first, but with an impossibly racist caricature whose presence continually challenges any sense of realism the story might otherwise have. Nevertheless, the way that these stories are told is altogether quite similar. The dialog is mostly casual and unobtrusively stylized, whether the speaker is an ordinary high schooler or a monkey trying to achieve godhood, and the general tone is rather relaxed and light-hearted. This is one simple story, told three times with a unified style, culminating in a single climax that is greater than any one of version could have achieved on its own. Chin-kee, although barely a character in his own right, is Gene Luen Yang’s most ingenious invention. Every single moment of him—whether he’s dancing on the tables or salivating over “Amellican” girls—is agony, a rebuke to every American artist and writer over the course of a century who allowed this horrible caricature to represent millions of people within our borders and hundreds of millions abroad. As white as he may be drawn, Danny’s humiliation at the hands of his cousin is a specifically Chinese-American burden: to be at the mercy of racist nonsense that threatens to supplant whatever image one wants to present to the world. While all three stories are necessary, thanks to Chin-kee, the story of Danny is easily the most original and most memorable. The art is serviceable enough to communicate the story, but it’s easily the most underachieving element in an otherwise outstanding comic. With few exceptions, the faces of the characters are drawn with identically flat lighting regardless of the environment and time of day, which denies the reader a sense of setting, which in turn sabotages the emotional vividness of events and even the characters themselves. Combined with the fact that many of the backgrounds are blocks of solid color, one occasionally gets the unsettling impression of talking heads floating in a light tan void. It doesn’t help matters that for some reason, most of the top and bottom of each page are simply empty space, the actual content only rendered within an identical square on each one. Forced to draw his characters within such a small space, Yang frequently has to depict them with simplified facial features that do a poor job of conveying emotion. There are some artistic successes in this comic, including a handful of striking panel layouts but the overall effect of the art is perfunctory at best. There are also times when Yang seems a little lost as to how to communicate his characters. I don’t object to unnaturalistic dialog in theory, but when a scene goes as far as to be simply exposition about topics the characters have no reason to discuss, it feels like the author is just wasting time he could be writing the characters in a more genuine way. His habit of representing what characters are thinking about by putting images of objects or faces in thought bubbles is unnecessary, their feelings being obvious from context, and instead of helping, simply puts an uncomfortable distance between the reader and the characters. In spite of my misgivings about the presentation, American Born Chinese is legitimately touching in a way few comics ever manage, and its unique structure is carefully harnessed to increase its emotional power. Amidst the interweaving of everyday life and a mythical past, we have the story of a boy treated like a foreigner in his own country for so long that it is only after years of searching that he discovers who he is and where he really belongs. Such a powerful story shouldn’t be overlooked. Nine years since the Greek ships reached the shores of Troy and began the famous war over Helen of Sparta, Agamemnon, the king of all the Greek kings, wounds the hero Achilles’ honor. The enraged hero withdraws from battle, unleashing a chain of events that have decisive effects of the outcome of the war, and Achilles’ own fate. I first read the Iliad when I was just 11 years old, around the time of its most (in)famous big screen “adaptation.” Ever since, I have made a habit of re-reading it every few years. I now have several translations – one in my native Bulgarian, several in English, and snippets of the original ancient Greek – under my belt. I should note that as a general rule, I do not enjoy re-reading books, especially not more than once. The Iliad has been the exception, in part because it is the richest works of literature that I have ever encountered, but also because the text’s various incarnations, from the original to its translations, are all unique, with their own merits. Anyone who has at least dabbled in translation knows that the translator must make choices about how the original text will be transmitted into its new form. During this transition, some of the meaning is always lost, a problem that holds especially true when it comes to poetry. The translators I have read (note: in the past decade alone, there have been eight new major translations) have all approached the Iliad differently, especially when it comes to vocabulary and metre. As a result, some of them have been easier to read than others; some have stuck close to the Greek and others have been looser (here is an excellent essay in the New Yorker that discusses four notable versions and their authors’ approaches in more in depth). No matter which version one chooses, it’s not something most people could sit and read for pleasure on a rainy day. It is long, it is dark (at places quite graphic), and it is quite difficult, although it does leave the reader with a profound sense of satisfaction whether one has read twenty lines or a hundred. The biggest irony here is that the Iliad was not originally intended to be read at all. It was meant to be performed out loud and to be listened to (there is a reason why the author calls upon the goddess to sing in the poem’s very first line). For all my dedication to the text, I had never actually listened to it before. Fortunately, I remembered that I happen to own an audiobook version of Robert Fitzgerald’s 1974 translation. It is one of the best-known and widest-circulated, although it has never been a favorite of mine. In part, that is due to his insistence of transliterating the Greek names into English (thus Achilles is Akhilleus), but also because his voice on the page is archaic and slow-moving. Yet, Dan Stevens’ performance brings the text right off the page, making it surprisingly accessible and a real pleasure to listen to. Fitzgerald’s text is rich and lyrical, and read aloud that comes through beautifully. The emotions of the characters – Achilles’ indignation and grief, Hector’s annoyance and determination, Andromache’s fear and love, Hera and Athena’s pettiness and frustration – were more vivid than ever, and I was able to picture the events of the story with rare vividness, becoming more of a witness than a distant reader. There is so much that I love about this text, and with every reading, I discover even more. One aspect that always captures my attention is the way Homer (or the people united under this name, depending on what you believe) takes great care to humanize even the most minor of characters. Homer gives every soldier who gets killed on the field, whether the audience has ever seen him before, at least a mention of his father’s name, and in several cases, much more than that. This is an excellent way to humanize the war. We are constantly reminded that this bloodshed has been going on for nine years, and while to the gods this is just a game for the sake of avenging Hera and Athena’s honor, the Greeks and Trojans are still people with families and stories of their own and who just want to go home. A common misconception has been that the poem details the Trojan war as a whole. In fact, it takes place over a very short period of time during the ninth year of the war. Yet, in this short span, several crucial events occur. The anger of Achilles is at the center of everything. It begins in one way, changes into something quite different by the end of the poem. For this, and so much more, Achilles’ development as a character is among my favorite aspects of the story. Of course, Achilles story is so much bigger than just him. When he withdraws from combat and begs his mother to have almighty Zeus avenge his honour (the Greek τιμή, or ti-meh, which translates as “esteem, honour, worship,” was a very important concept for the ancient Greeks), he has an opportunity to reconsider his path in life: should he sail home and enjoy a long life, only to be forgotten, or should he remain at Troy, doomed to die but gaining everlasting glory? What purpose will his life serve? His dilemma is central to the poem, and therefore echoed throughout by other characters in other places. On many occasions, the Greek leaders express a desire to go home, only to be dissuaded each time. They all have reasons of their own, but in the end, they must ask themselves whether they are ready to put nine years of sacrifices behind them, rendering them worthless. In the end, the answer – as we all know – is no. Ultimately, the Iliad is a poem about war and about the meaning one chooses for one’s life, knowing that it will, of course, end. The Iliad has been my favorite work of literature for many years, never ceasing to surprise and teach me – I can only wonder what new things it will reveal to me in the future. Whether in the original or in translation, on the page or on audio, this is a rich and complex text that should be read at least once. I can now say that I have had a very positive audio experience with it; the 2014 audiobook version is one I will likely return to in the future. On the surface, Dwayne Hoover is the ideal American: he owns dozens of businesses in Midland City, Ohio, and is one of the city’s wealthiest residents. He is charming and personable, beloved by his employees, his girlfriend, and even perfect strangers. But underneath the surface, he is being torn apart by a psychosis that he keeps secret from everyone, no matter how much his hallucinations and delusions intensify or how lonely he becomes. Meanwhile, in a cramped Cohoes apartment, prolific and virtually-unknown science fiction writer Kilgore Trout is preparing to leave for the Midland City Festival of the Arts, which he has been invited to more or less by accident. Embittered by years of economic failure and the terror of approaching old age, Trout plans to deliberately embarrass himself at the festival in the hopes of proving, once and for all, that the arts are worthless. In just a few dozen hours, these two strangers will meet and the resulting explosion of senseless violence will change both of their lives–and the world itself–forever. Those who have read our self-introductions will probably remember me listing Breakfast of Champions as my favorite book. Upon rereading it, my feelings haven’t changed, although Kurt Vonnegut’s Slaughterhouse Five is always in position to edge it out. I felt taking a critical eye to a book I love would be a good exercise in objectivity. Although Kilgore and Dwayne are the two most obvious focal points, Breakfast of Champions is primarily a portrait of a United States torn apart by apathy and starved of spiritual meaning. Dozens of other characters, most burdened by loneliness, personal catastrophe or the trials of a racist society, weave in and out of the story, connected to one another in a maze of seemingly meaningless coincidence. Most of the characters have little connection to the story itself, but Vonnegut rejects the notion–at one point, explicitly in narration–that a story should have leading characters and supporting characters, since life itself doesn’t. He peppers the story further with tangents about the United States and its history, written as though about a distant and exotic land, full of unnecessary hardship and slowly destroying itself from the inside with pollution, violence and spiritually-empty capitalism. One gets the sense of a circle of hell where millions of destitute people struggle to make it big while those who already have, like Dwayne Hoover, find nothing but emptiness in their wealth and status. Regardless of whatever Vonnegut’s goals may have been, this book would be a forgettable mess if it didn’t have Dwayne and Kilgore to center it. Kilgore Trout in particular, is Vonnegut’s best-remembered character for a reason. With his dry humor, unbridled bitterness and self-hatred with an intensity bordering on self-righteousness, Trout’s blunt manner has a way of stealing any scene he’s a part of. On the other hand, Dwayne Hoover, in spite of his alleged charisma, controls scenes not with his personality, but by provoking our sympathy as he suffers through his illness in secrecy. He also carries a burden of grief: a wife he lost to suicide, her death casting a shadow over everything he does. Despite the heavy subject, I actually adore this book for its somewhat incongruous sense of fun. Between the narrator’s deadpan humor, frequent tangents about several of Kilgore Trout’s high concept science-fiction novels, and a series of Vonnegut’s doodles depicting objects and symbols that appear in the text, Breakfast of Champions is a quick read without a dull moment. The myriad connections between the random inhabitants of Midland City engage the reader in an endless game of comparison, looking for meaning in coincidences that might be no more important than they appear. And although I can’t explain too much, two thirds of the way through, Vonnegut delivers his masterstroke, the book gaining a metafictional edge that gives the whole story much more thematic power and is a source of some of the funniest jokes the author has ever told. Is Breakfast of Champions Vonnegut’s best book? No, definitely not. Slaughterhouse Five, at least, is a stronger book overall, and possibly Bluebeard too. But Breakfast of Champions is certainly my personal favorite, in large part because of the material it tackles. Ultimately, this book comes off like a conversation that Vonnegut is having with himself, pulling his characters’ strings as they act out a drama that will reveal the truth about the value of art. Does art really have the power to change the world? And if so, how do we use it safely? I’d like to think that Breakfast of Champions is a pretty good start. PS: A few things need to be explained about this book for moral, rather than artistic, reasons. Despite Vonnegut’s attempts at being progressive, the forty-four years since initial publication have not always been kind to this book. For instance, “chinaman” is a word that has aged very poorly, and was not much good to start with. More prominently, Vonnegut uses the “n-word” extensively throughout the text. I would argue that the slur is mindfully used as a symbol of the bigotry eating the country from the inside, but for many modern readers, that excuse isn’t nearly enough. Lastly, Vonnegut’s portrayal of Dwayne’s illness as being, on some metaphorical level at least, an extension of the spiritual sickness that affects the whole country is not the finest moment in the history of disability representation, although for what it’s worth, I know Vonnegut was trying his best. This book comes off as an attempt to understand what Mark, his schizophrenic son who was hospitalized around the time this book was written, was going through, and I’m always inclined to be lenient to someone who is honestly trying to understand more. In a world where people live in woods populated by blood-thirsty nature spirits that would gladly dispose of us, a human queen is chosen for balance and peace. However, what happens when this balance is disturbed? And what could possibly disturb it? 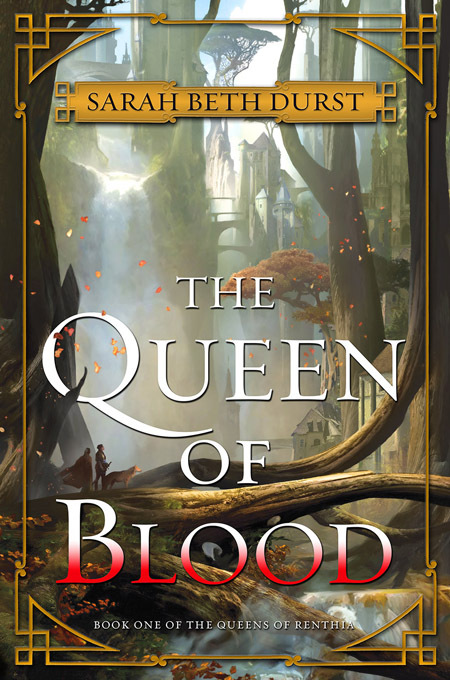 Sarah Beth Durst’s newest adult novel, The Queen of Blood, is the first installment in her upcoming Queens of Renthia series. Daleina is only ten years old when her village of Greytree (within the kingdom of Aratay, one of five kingdoms in Renthia) is attacked by rebel spirits. Nearly everyone is slaughtered, but Daleina and her family survive thanks to her having the ability to control spirits. Having survived this horror, Daleina dedicates her life to training in the hopes of becoming the next queen. Along the way, she forges strong friendships, an alliance with a disgraced former warrior for the queen, and is forced to make questionable choices in order to win the crown and ensure that her family and the people of the kingdom will not have to suffer the fate of Greytree. I have been a fan of Durst’s writing for years, in large part due to its incredible versatility. Every story, every premise, every protagonist is entirely unique and the universes they inhabit – whether our reality with a touch of the magical or an entirely foreign world – are rich and well conceived. The land of Renthia is no exception, and it certainly is one of my favorite thus far. I love the idea of a whole civilization existing among the trees, everything being connected by bridges and wires. Durst’s narrative is enriched by exquisite detail, beautiful and sometimes haunting descriptions. The relationship that she creates between nature and man is a complex ones. The nature spirits are fearsome, but without them, nothing can exist – fire ceases to burn, the crops cannot grow, the wind doesn’t blow. At the same time, without a human queen to control them, they would create chaos, which would destroy everything. One of the book’s strengths is how limited Daleina’s gift is. Unlike her peers, in order to pass the many obstacles in her way, she must rely on her quick mind, determination, and uncanny ability to strategize and solve problems in unexpected ways. The way her unyielding determination, prevails over self-doubt, low odds and in the face of tough choices, resonated with me and strengthened her as a character. Good characters in general are The Queen of Blood’s specialty and one of the novel’s greatest strengths. Durst provides a view into the thought processes of characters major and minor; this proves particularly important in the case of Champion Ven, the Academy’s Headmistress, and Queen Fara, who are three of the most crucial, and most complex, characters in the novel. At the end of the day, they are all imperfect human beings and the things they choose to do, while not always forgivable, are at least understandable. The price for attaining power – and retaining it – is enormous, requiring terrible sacrifice, both personal and global. Thus, even when the ending the reader hopes for does come true, it does not feel like a triumph, but a dark and somber meditation on what has been lost along the way. At times, the sheer amount of background exposition was too much for the book to be a perfect read. This might be expected for the first novel in a series, but it made the narrative stall out. Furthermore, the narrative felt a bit uneven; the book takes place over a large time-span, but that comes at the cost of the believability of some character relationships. At times, I felt that I simply accepted Daleina’s friendships as facts rather than being able to believe them emotionally. I was also not fully convinced by the romance in the story (that is, how it came about), as it is not given enough time to develop properly. Despite these problems, I was enthralled by The Queen of Blood and the world of Renthia. I think that there is a lot of potential in this series, and really look forward to reading the next installment.